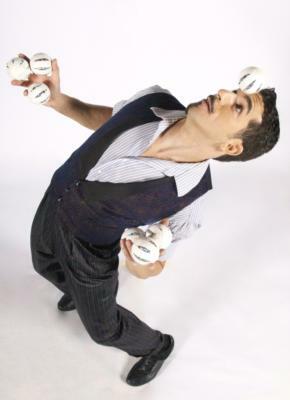 Leaping with supreme agility, master manipulator and equilibrist extraordinaire Bernard Hazens, leaves audiences in jaw dropped amazement. With a skill set of theater, dance, and circus in his arsenal, Bernard left his lovely Mediterranean hometown of Ashdod, Israel in 2004. He exploded his way into the circus world with his one of a kind act. 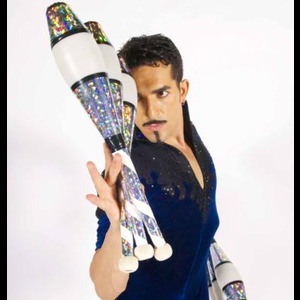 Bernard has since performed his incomparable act at numerous venues around the World, NBA halftime shows, and corporate galas. His television appearances include “Les Plus Grande Cabaret” hosted by Patrick Sebastian and on “Rising Star”, Israel's version of America's talent show “ The Next Big Thing”. Bernard has appeared multiple times, here in the States, with prominent dinner theater Teatro Zinzanni, utilizing his full array of talents. Please note Bernard Hazens will also travel to South San Francisco, Belmont, Daly City, Brisbane, Oakland, Sausalito, Alameda, Emeryville, Tiburon, Berkeley, San Bruno, Albany, Mill Valley, Pacifica, Piedmont, Richmond, Corte Madera, El Cerrito, Larkspur, Millbrae, San Quentin, Tamal, Burlingame, San Rafael, Canyon, El Sobrante, Greenbrae, Orinda, San Leandro, San Mateo.